In this edition of homify 360, we head to the countryside, where elegant villas and intriguing stylish homes attract and delight our senses. The home we visit today is exceptional, and although it blends in with the surrounding villas, it is stylish and inviting. The team of architects at Lemański have ensured that this modern home is sophisticated and welcoming, from the strong exterior design to the cosy interior décor. The villa even has a greenhouse for relaxing and unwinding indoors. Would you like to see more? Well then, let’s begin our tour. The pitched roof and traditional shape of this beautiful home set in the country makes for a charming and almost fairy tale experience. The gorgeous green lawn that surrounds this villa is elegant and attractive, while the structure itself is a mixture of old fashioned design with modern features. The home itself is flowing and functional with the large rooms communicating easily with the wonderful garden drenched in sunlight. The façade of this home is interesting and attractive, with natural stone mosaic tiles adding a modern feature to the front of this house. It’s harmonious and simple in colour, allowing this modern villa to be charming and eye-catching. Would you like to see the interior? Let’s take a look to see what magic awaits us on this tour. This interior is bright and spacious. The neutral and warm colour palette is luxurious and welcoming, creating a comfortable living room that is decorated in beautiful tones of beige and brown, while large floor to ceiling windows allows for the space to be bathed in natural sunlight throughout the day. This adds to the warmth and charm of the interior, making it seem more spacious and elegant too. 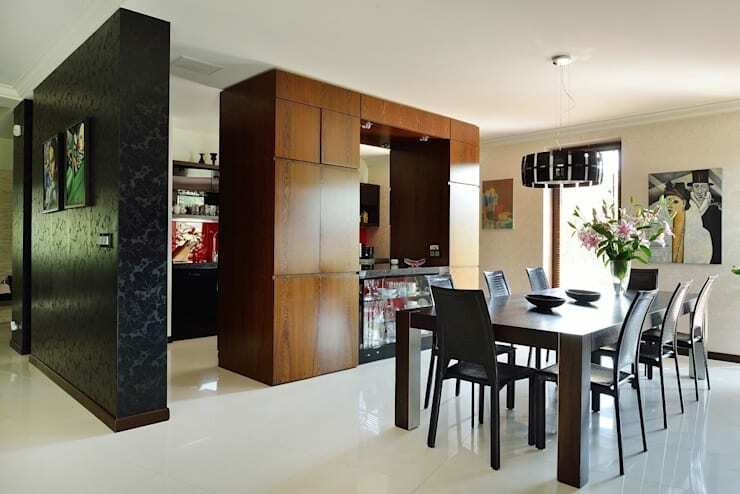 The kitchen and dining room are open plan, which allows for a more spacious looking interior. The chocolate coloured wood dominates here, this contrasts greatly with the neutral and lighter tones of the living room area. A large cabinet divides the kitchen from the dining room area without cutting it off entirely, while also creating more storage space. Natural sunlight provides fantastic lighting to this space throughout the day, making it comfortable and stylish. This greenhouse is a surprise addition to the modern family home, but it creates a great space to entertain under the moonlight and stars. 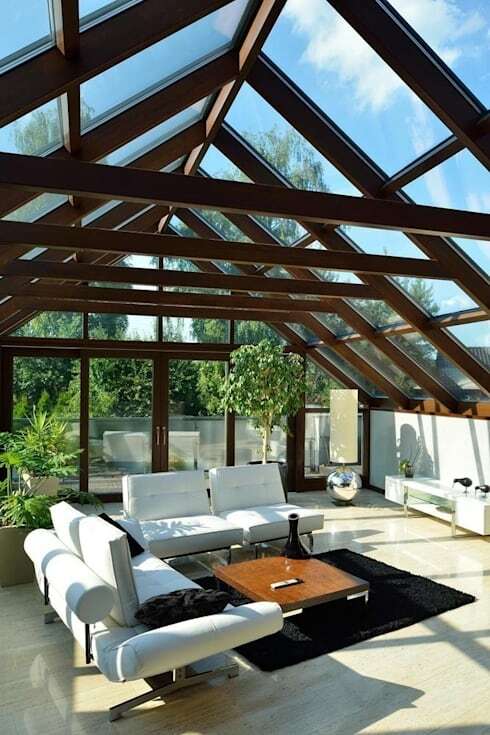 The glass ceiling is excellently structured, with solid wooden beams adding to the strength and style, making for a sunlit indoor area during the day. The elegant finishes and cosy furniture makes this greenhouse comfortable and attractive, not forgetting the fabulous vegetation that can be cultivated as you like. This will ensure that you never be without your favourite herbs and greens again. The sensational swimming pool at the back of this home just makes this living space that much more amazing. 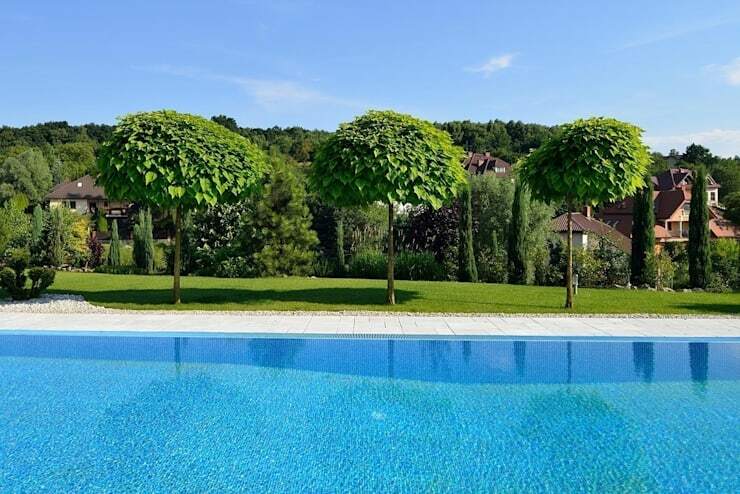 Spend those hot summer days soaking up the sun while remaining cool and fresh in this stunning blue pool or have a pool party and barbecue while you at it. It’s surrounded by beauty and gorgeous natural sunlight, adding to the sophisticated home style. We have to the end of this Ideabook, but let’s take a final look at dusk and appreciate this beautiful home. The terrace makes a great social zone, perfect for those days when entertaining family and friends at the poolside is a must. The simple colours of the exterior along with the green lawn and garden makes an elegant and attractive home. If you love this Ideabook, then The Renovation of a Country Home is a must read too! Would you add a greenhouse to your home?